Lastly set your newly added entry as the default. There have been a few posts appearing this week which themed on encouraging the reader to start using the Func and Action delegates. It started with Ian Randall (@kiwipom) suggesting to Give your code just a little Func-y love. This was followed by Ivan Towlson (@ppog_penguin) scripting Make my Func the higher-order Func, quickly followed by Func-ier and Func-ier which wanted to improve on the separation of concern. I thought I would add my view and say to the readers – “Don’t do it!” At least not with the example given. It’s difficult to understand and convoluted! @itsgrego posted a tweet this week bringing our attention to Why you shouldn’t comment (or Document) code. I would think the majority of us would agree with the contents of that article. I do! So code should be easy to read, and I would encourage you to write your code like this. Yes it’s the same as Ian’s starting point and it takes up 6 lines, but isn’t it so much easier to read and you understood exactly what the coders intention is. Come back to this code some years down the track and you will understand at first glance what the coders intention is. It’s self documented and there is separation of concern. I must state here and now that “I love delegates” and I would encourage you all to be using them consistently throughout your projects. When you see yourself writing repetitive code (or copy / pasting) then stop and ask yourself about delegates? I’ll take the example above and explain how I would incorporate that code in a delegate. In the real world there is more to the process about retrieving and storing data than can be described in 6 lines of code. One area of concern is error handling. If you have been wrapping your Methods in try / catch blocks then you know about repetitive code and copy and pasting. So I’m going to change my example above to what I would consider a real world example. In the example above I have wrapped my GetOrder code into a delegate. I then send that delegate to a function I have written to take care of my error handling. From now on each time I have to make a call and need to handle any exception I will use this new function. Thank-you Func-y! Reactive Extensions appealed to me because the amount of code required to set up an observe / search routine is minimal. The syntax is very powerful. All the above attributes were important features for my auto complete text box. I highly recommend that before you proceed any further that you read and understand Pete Goo’s example. What was missing from Pete Goo’s example was a Popup that would display each time text was entered into the textbox. I also wanted to have a reusable user control which would contain the repetitive code base. The solution that appealed was the creation of Ioan Lazarciuc called Auto Complete for Textboxes in WPF. Ioan was inspired by the AutoCompleteExtender in the ASP.NET Ajax control toolkit and also because his solution requires minimum intervention of existing WPF code. What Ioan’s solution lacked was the ability to do an asynchronous search while the operator keyed the search phrase. PeteGoo’s solution has taken care of this for us, so we have all the code snippets required to build an autocomplete textbox. All we have to do now is put it all together. 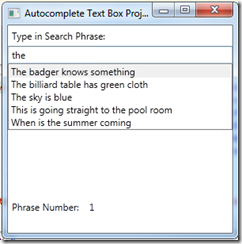 The attached solution is my suggestion how to implement an auto complete textbox in WPF that allows asynchronous search capabilities to a web service. I will not be going over what my two contributors have already scripted, so you may want to study their solutions first before proceeding. My extender is a WPF user control that handles all the background tasks when the operator keys a search into the selected textbox. To call my extender is very simple. Execute the application and the popup will display suggestions as you are typing characters into you TextBox. You can use your keyboard or the mouse to select the correct phrase. You can download my source code and example here. I have been struggling today to Read data from multiple SQL tables. I am using the MySQL Net Connector (http://dev.mysql.com/downloads/connector/net/) and I have imported the MySQL database into Visual Studio (ADO.NET Entity Data Model) and created the relations. I now want to collect some data from the database into my custom Business Entity. If I query a single table I have no issues. If I query multiple tables however, the query fails. Address = "Some Dummy Value"
// list2 is populated as expected. // Object reference not set to an instance of an object. I posted the issue on Stack Overflow and I still awaiting a reply that resolves this issue.